MK Dons substitute Daniel Powell scored in the fourth minute of stoppage time to earn a point at Bristol City. Jonathan Kodjia gave City an early lead at Ashton Gate when he tapped Bobby Reid's cross into an empty net. Luke Freeman wasted a glorious chance to double the advantage just before the break when he fired over from 12 yards. Dons dominated the second half as Dean Lewington hit the post, before winger Powell jinked into the box to curl a sublime effort into the corner. City remain bottom of the Championship, while Dons move out of the relegation zone and up to 19th. The visitors, who have kept only two clean sheets this season, had their defensive frailties exposed in the sixth minute as Frenchman Kodjia was left unmarked in the box to score his sixth goal of the campaign. The game turned scrappy after the goal, but burst into life again just before half-time when Kodjia found space down the left and squared the ball to winger Freeman, who smashed his effort off target. Moments later, a mistake from Dons defender Kyle McFadzean let Kodjia in, but David Martin palmed his low effort away. The visitors looked rejuvenated after the break as Ben Reeves's shot was tipped over by Frank Fielding and Lewington's cross evaded everyone before bouncing off the upright. Dons continued to dominate as Fielding pushed substitute Robert Hall's long-range effort past the post before McFadzean fired wide from 25 yards. Powell earned Dons a deserved draw as he bent a shot past the outstretched arm of Fielding. "It's a tough result to take because of the timing of their goal, but MK Dons fully deserved it on their second-half display. "I thought we had seen it out for a win we desperately needed, but in the end that didn't happen. "We didn't keep possession in the second half. There were probably some nerves because of the desperation to give our fans the result they wanted. "Now we have to look at ourselves at the bottom of the table for a couple of weeks, which no one wanted." "A point was all we deserved. We were poor first half and Bristol came out of the blocks quickly. "At half-time I had a strong word with my players about what it means to wear the shirt and the pride we all have in our club. "I didn't see that in the first half, but in the second we showed it in abundance. It was a wonder goal from Powell, but the whole team deserved it in the end for the application and commitment shown. "We may have nicked a point in the 90th minute, but I feel that we are moving on." Match ends, Bristol City 1, MK Dons 1. Second Half ends, Bristol City 1, MK Dons 1. Attempt saved. Jonathan Kodjia (Bristol City) right footed shot from the centre of the box is saved in the top centre of the goal. Assisted by Mark Little with a cross. Jordan Spence (MK Dons) is shown the yellow card for excessive celebration. Goal! Bristol City 1, MK Dons 1. 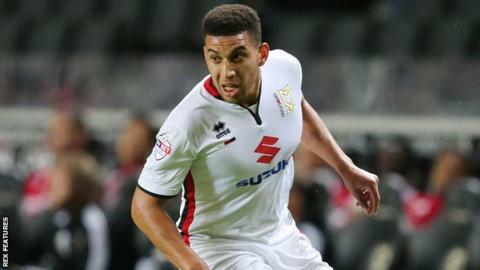 Daniel Powell (MK Dons) right footed shot from outside the box to the bottom right corner. Assisted by Dean Lewington. Attempt missed. Carl Baker (MK Dons) left footed shot from outside the box is too high. Assisted by Jake Forster-Caskey. Attempt blocked. Robert Hall (MK Dons) right footed shot from the centre of the box is blocked. Assisted by Jake Forster-Caskey with a headed pass. Callum Robinson (Bristol City) wins a free kick on the left wing. Carl Baker (MK Dons) is shown the yellow card. Jake Forster-Caskey (MK Dons) wins a free kick in the attacking half. Substitution, Bristol City. Callum Robinson replaces Luke Freeman. Substitution, MK Dons. Daniel Powell replaces Josh Murphy. Attempt blocked. Nicky Maynard (MK Dons) right footed shot from the centre of the box is blocked. Attempt missed. Kyle McFadzean (MK Dons) right footed shot from outside the box is close, but misses to the right. Assisted by Josh Murphy. Corner, MK Dons. Conceded by Frank Fielding. Attempt saved. Robert Hall (MK Dons) left footed shot from outside the box is saved in the bottom right corner. Assisted by Diego Poyet. Delay in match Jordan Spence (MK Dons) because of an injury. Substitution, Bristol City. Derrick Williams replaces Joe Bryan. Offside, MK Dons. Ben Reeves tries a through ball, but Josh Murphy is caught offside. Jake Forster-Caskey (MK Dons) wins a free kick on the right wing. Offside, MK Dons. Dean Lewington tries a through ball, but Simon Church is caught offside.